I am now totally in love with the patterns from Black Sheep Bags. 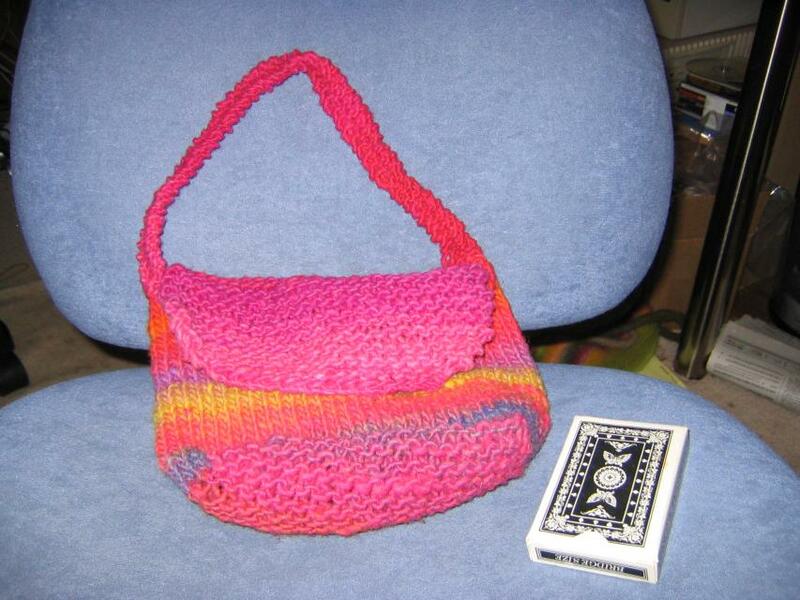 They were the source for the booga bag pattern, and that went so well that I decided to try one of their teeny tiny bags as a birthday gift for my niece. Here it is pre-felting with a deck of cards for scale. Here it is completed. Yes, I own Star Trek playing cards, I’m that much of a geek. I think on the next go-round, I’m going to modify the pattern some and also add a button to help keep the flap closed. I’ve learned enough now to change the patterns to my own taste. This is fun! I may be an addict. Okay, so I go by one of my local yarn stores to get a $1 stitch holder (aka glorified safety pin). 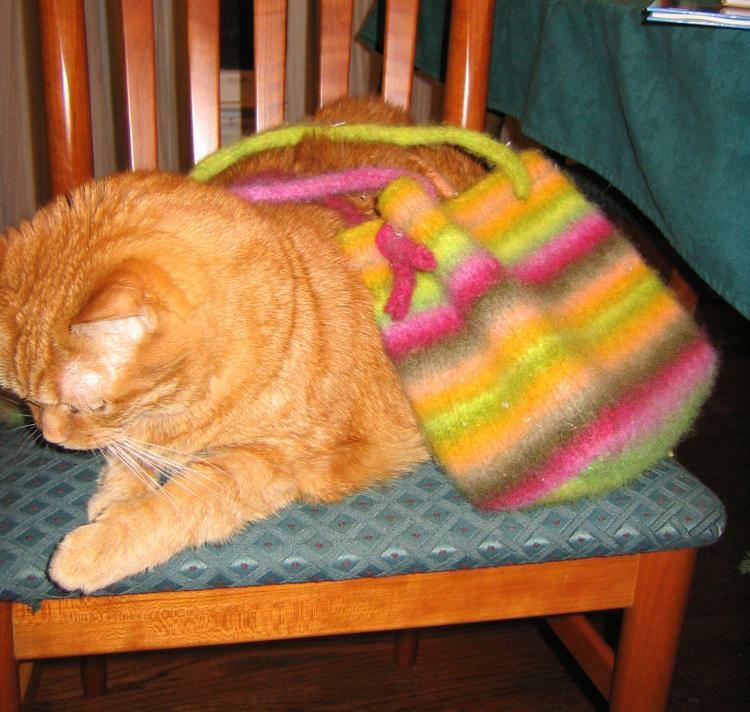 While I’m there, I’m carrying my booga bag, and everybody oohs and aahs gratifyingly over it. Then the yarn saleslady motions to me and says, “We’ve got some new stuff in the back room, haven’t even put it out yet!” She takes me back there and lets me caress the yarn. Hmm… I come in for a one dollar thingie, and they want me to caress the $19 skeins of Big Kureyon. I’m pretty sure they’re trying to feed my habit. Suppliers are the same everywhere! I’m doomed! Ze Booga Bag, she is mostly done! The knitting was actually pretty easy, once I figured out how to “pick up and knit twisted” the stitches along the bottom. The most boring part was doing the i-cord for the handle. I didn’t realize until I got to that point that I had to knit 8 freakin’ feet of it. Skinny, but time-consuming. Good waiting room work, though. 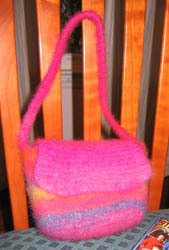 Here’s the bag pre-felting. At this point, it’s all knitted, the ends are woven in, and it’s ready to go into the washing machine. The box on the chair is the box I had planned to put inside it to block it on. In this case, blocking means putting the bag snugly over the box and letting it dry to give it a nice flat base and sides. Here’s the bag after one go-round in the washing machine with a pair of jeans and two towels. It’s getting a little smaller, a little fuzzier, and losing some stitch definition. I didn’t put it in a zippered pillowcase as recommended, because I wanted the stitch definition to really fade, and I figured the extra friction would help. Here’s the bag after a second go-round, this time with a little bit of detergent which I thought might speed things up. I think it did, as you can see it’s much smaller now. However, it’s also really shiny because the detergent didn’t rinse out well. So I put it in a zippered pillowcase (I didn’t want it to fuzz up much more) and tossed it back in for another brief go-round. Here’s the bag still damp from its brief third and final go-round in the washing machine, blocking on its box. It’s good to know that the Kureyon shrinks more lengthwise than it does in width. It’s probably down by a third of its size. After this picture was taken, I picked off the fuzzballs. The bag will stay over the box until it dries, which could take a couple of days. 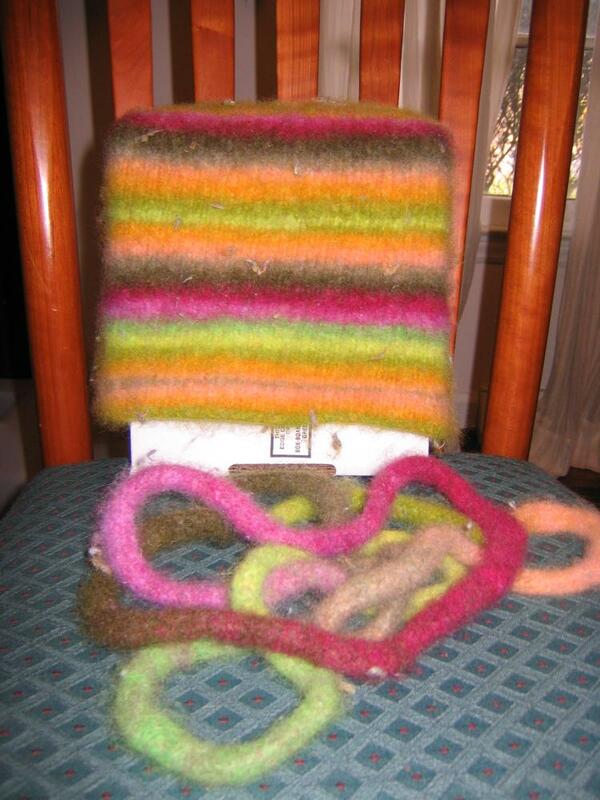 This project has been very fun, and I’m ready to tackle more felted items! 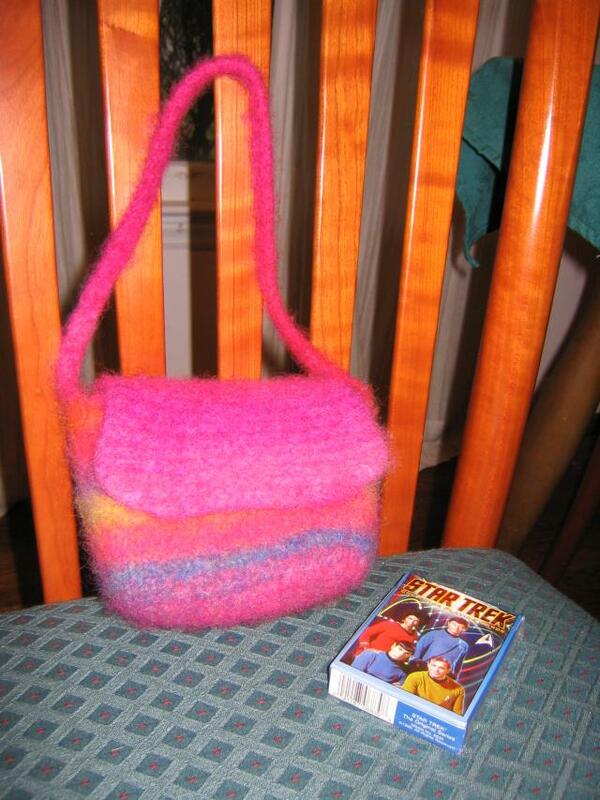 Just in time for warm weather, it’s a fun knitting thing I can do that holds up well to use in any season! Whee! The completed bag. Obese cat for scale. My daughter accidentally got dry-erase marker on her favorite shirt. Does anyone have tips on how to get the stain out? 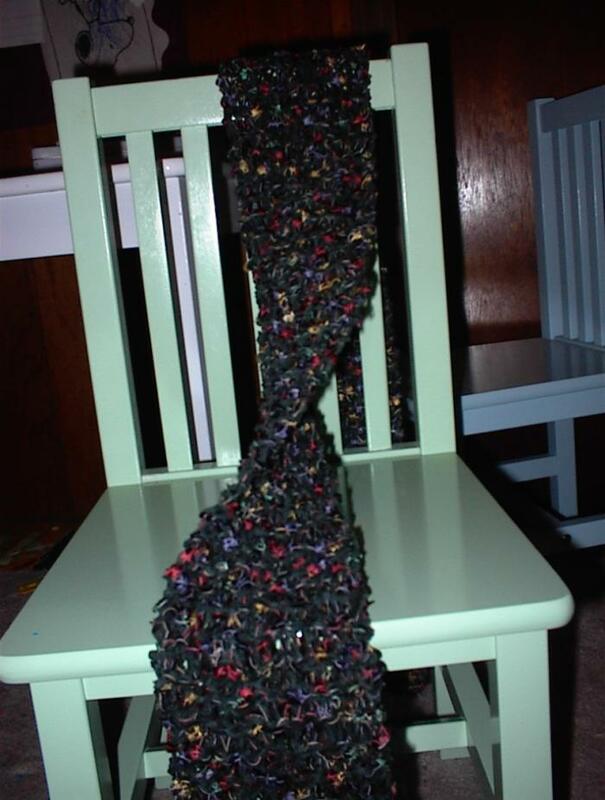 Here’s a new scarf as a big “nyah!” to the guy who claimed that there’s no such color as berries. Lookie what Tessima sent me! 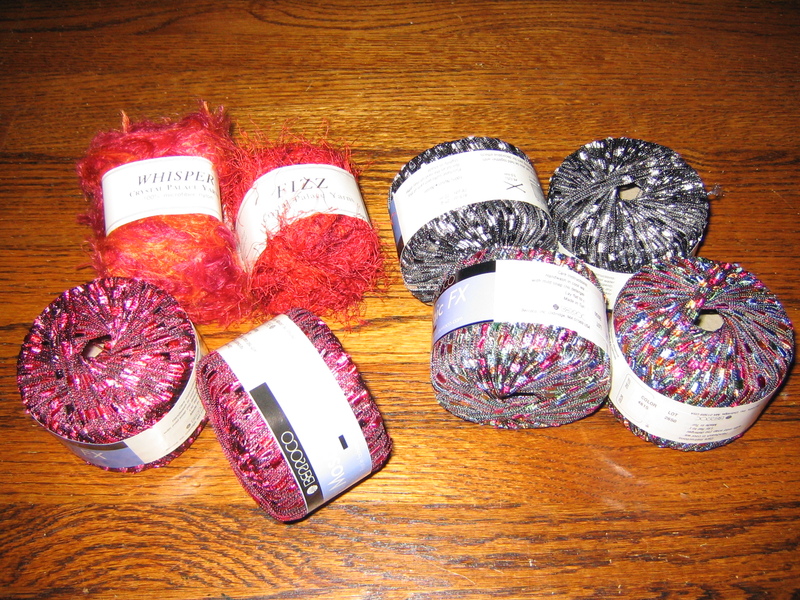 It’s a selection of totally faboo yarns! You’re damn right the picture is huge.It deserves it! I know somebody who’s going to be getting some glitzy duds! Woot! At last, I get to work on my booga bag! I’m about halfway done with the knitting. 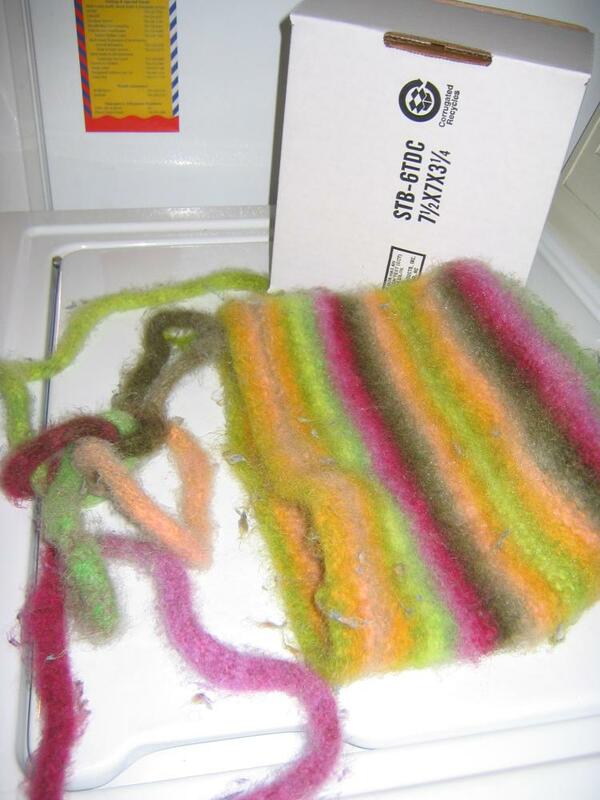 After knitting comes felting, which will shrink it down and give it that lovely firmness and a fuzzy texture. 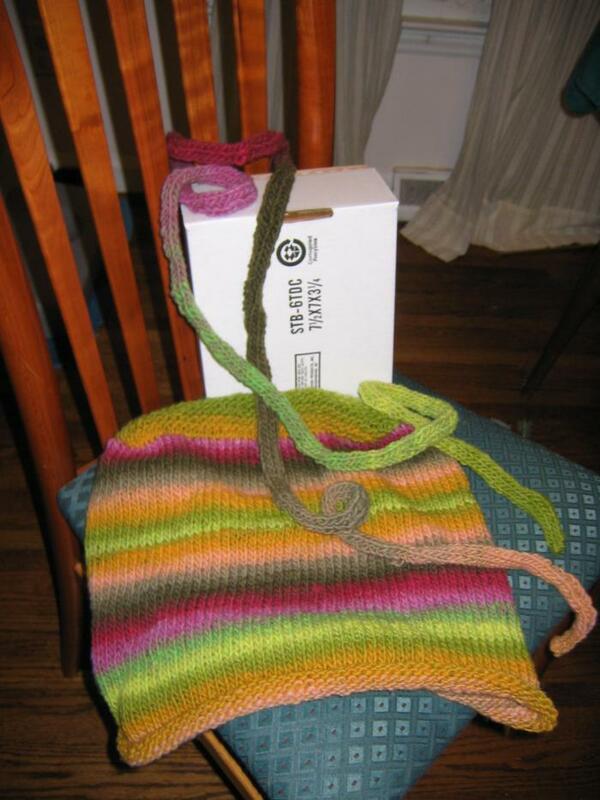 My mother in law bought me the Kureyon yarn, so I’m doing a scarf for her out of Noro Lotus as a thank you. 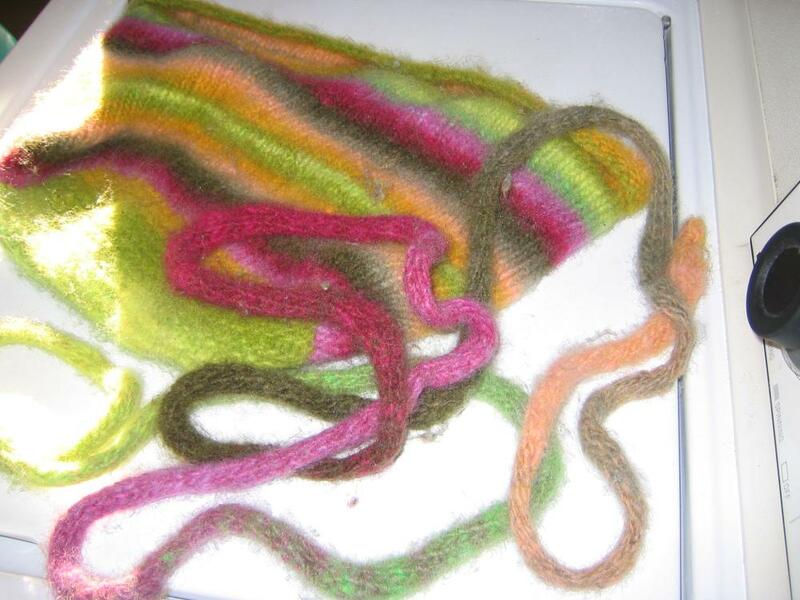 It’s a great yarn, and I’m doing a seed stitch to show off its glitz without getting too complex. Whee! New projects are good! Finished up another one today. This one was on #13 needles, straight garter stitch, using Crystal Palace cotton chenille in bottle green (less yellow/army green than that picture looks) and Plymouth Paradise carried along. I call it my Susquehanna scarf, because it reminds me of the river valley in autumn, with all the blue and autum colors on the blanket of green. I hope I’m able to visit the ancestral home in Pennsylvania this fall. I miss it. 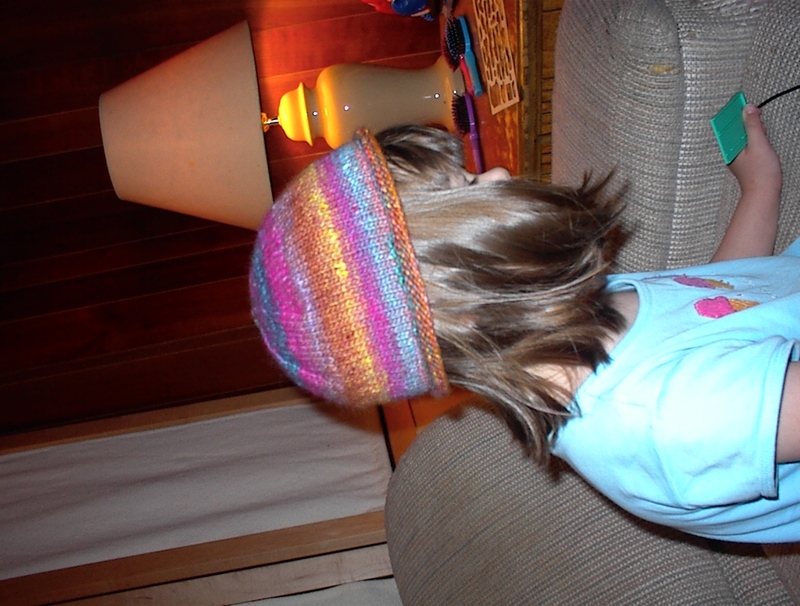 Okay, so my daughter wanted a hat like the others I’d made, so I had to knit a THIRD hat. But it was fun. She picked out the yarn herself, and here’s the result. This was the best yet, with the crown decreases working out perfectly to make a cool star-like pattern on the top. 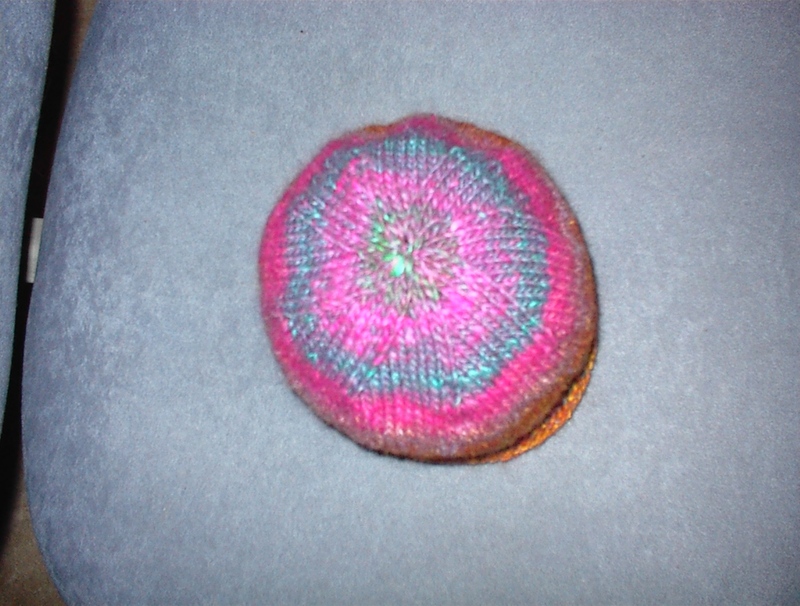 I cast on 96 stitches using #6 needles to make a more defined stitch pattern. Here’s my girl modeling it. You’ll have to turn your head sideways, because I don’t feel like opening up Photoshop this morning just to rotate the picture 90 degrees. I like it. All she needs is a little tie-dyed shirt and she’s ready to follow Phish on tour. 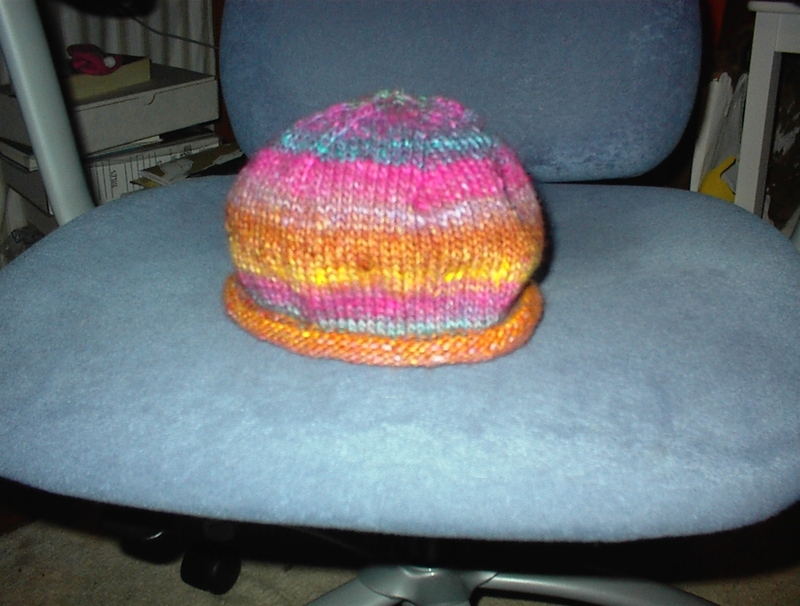 As a side note, I have just about enough yarn left over from the other hats to make another hat. I’ll never be free of the roll-brim beanie!